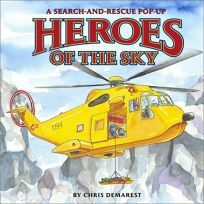 Heroes of the Sky: A Search-and-Rescue Pop-Up by Chris Demarest, follows a helicopter rescue squad in a board book with flaps, pull-tabs and pop-ups. Warm watercolors clearly delineate the equipment used and tasks performed in the mountain rescue of an injured climber. Important parts of the helicopter and the contents of a first aid kit are labeled.